Cyclone © 1998 ICE (Innovative Concepts in Entertainment). 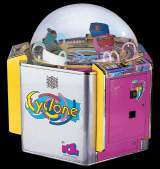 Cyclone is a 3-player, hand /eye coordination skill game which challenges the player to win the progressive jackpot. Dimensions : 52in. x 46in. x 48in. All ticket settings are completely operator adjustable so that percentage payout is possible.